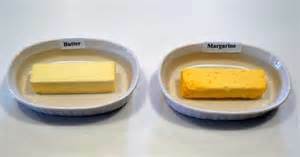 Eating margarine instead of butter really does reduce your risk of heart disease, researchers at Harvard University suggest. 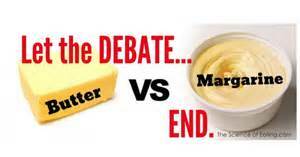 Experts this week cast doubt on the results of recent studies that promoted the return of butter and cream. New research had suggested that those who cut down on full-fat milk and other dairy and meat products that are high in saturated fat are no less likely to suffer a range of diseases, including heart disease, than anyone else. But now Harvard scientists have said that their research shows that saturated fat is bad for our health after all. Surely we all knew that? - They said the reason for the other researcher's findings may be that many of those who cut down on saturated fat then eat more refined carbohydrates such as white bread, which they found was just as big a risk for heart disease. Instead, their study showed that replacing saturated fat with foods high in unsaturated fat - such as margarine, olive oil and nuts - significantly reduced risk. Researchers at Harvard University analysed long-running diet and health information from 127,000 Americans.They found that replacing 5% of a person's energy intake from saturated fat with foods high in polyunsaturated fat, such as fish, reduced the risk of coronary heart disease by 25%. 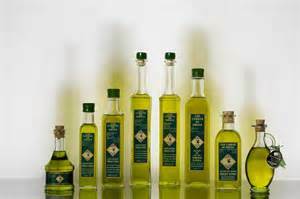 Replacing the same amount of saturated fat intake with foods that contain high levels of monounsaturated fat, such as olive oil, reduced heart disease risk by 15%. But replacing saturated fat intake with refined carbohydrates saw no fall in heart disease risk.